As I had mentioned in my first post about Adobe Day, there were several well-known tech comm authorities presenting, and Scott Abel was the first presenter. Scott is the founder and CEO of The Content Wrangler, Inc., and he has a great Twitter feed and blog, if you haven’t read them. Scott’s presentation was called, “More than Ever, Why We Need to Create Structured Content.” If you’ve never read Scott or seen Scott speak, he is a force to be reckoned with, as he’s definitely got strong opinions from his experiences, and he’s not afraid of letting you know what he thinks. Scott explained that structure is in everything we do–including in nature–so it would make sense that content needs to be structured as well. Structure formalizes a content model and provides authoring guidance. It can enhance the usability of content, providing visual cues and is the foundation for automatic delivery of content through syndication. Structure makes it possible to efficiently publish to multiple channels, outputs and devices from a single source, making it a critical component of transactional content and making business automation process possible. By providing structure, it is possible to adapt content and leverage responsive design techniques. Structure also allows us to leverage the power of content management systems to deliver content dynamically and increasingly in real time. By creating structured content, it is possible for us to move past “persona-ized content” and facilitate innovative reuse of content in known sets of related information as well as in the unknown needs as well. Scott quoted author and technologist Guy Kawasaki by saying that innovators must allow time for the majority to catch up; new ideas take time to filter through. He followed up with the question, “How much time does it take to adopt?” He answered his question by explaining that technological innovation is getting faster, and the technological adoption rate is becoming shorter, which is good news. However, how long to adopt structured content? He explained that it’s actually not a new idea–the idea started in 1963! It started with the Sequential Thematic Organization of Publications created in the airline industry to standardize airline manuals. 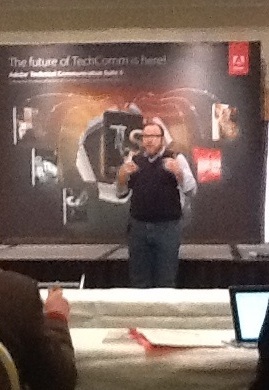 With that in mind, Scott presented that the question now is to figure out where are we today with structured content. Scott concluded that right now, one of the major challenges is that old ideas are getting in the way because many technical communicators are still stuck with design concepts created in the print paradigm. Other major challenges include the lack of knowledge and experiences, writers making manual updates, the lack of human resource support, and making tools work with configurable content. He did point out that lots of reuse content is going on! His point was that the tools work, but it’s the people and processes are the problem, as Sarah O’Keefe paraphrased him on Twitter. So when asked why we should be technical communicators, Scott’s response was that as technical communicators, we know how to create structured content. Knowing how to create structured content increases our value and makes us marketable. “Our professional needs to change whether we like it or not,” he concluded, to keep up with these technological changes. Much of what Scott talked about in his presentation was echoed again in the panel discussion later in the morning. Scott had provided a few examples during the presentation which showed what unstructured content versus structured content looked like, and it was very clear what the differences were. As technical writers, as Scott said, we understand the importance of structured content and how reused content can be used effectively. Those who don’t have that mindset tend to repeat the same processes and make more work for themselves, wasting time and money for a company. We have value, and we need to promote our skills in creating this kind of content organization. I think technical communicators take this ability for granted, and by being proactive in showing how we can help create efficient and structured content, we can add value not only to ourselves, but also provide on a larger scale a true cost-saving service to our respective companies and clients. Scott later offered his slideshow online, which is available with his permission. This entry was posted in Uncategorized and tagged Adobe, Adobe Day, Adobe FrameMaker, Adobe RoboHelp, content strategy, Content Wrangler, Framemaker, Guy Kawasaki, Methods and Theories, reuse content, ROI on technical communication, Scott, Scott Abel, single source, single sourcing, singular experience, structured content, tech comm, tech writer, tech writing, Technical communication, technical writing, Twitter. Bookmark the permalink. Seems that the access is not possible. Google Docs tells me that I need special rights to access. Seems that the file was not made publicly available in Google Docs? I had problems too–I’ll see if I can follow up with Scott and get a corrected one or see how one can access the info. I did get the original URL from his Twitter feed.